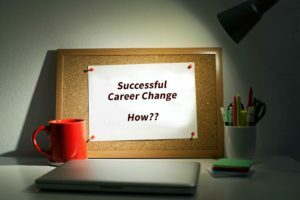 If you’ve identified the fact that you need to change careersuccessful-career-changes, taken a step back, chosen something you’d like to pursue, and carved out the necessary headspace to make things happen – well done – you’re almost there. We won’t dwell on this point for too long, but as it forms the foundations of your career change, it is worth mentioning. If you’re walking along a path and there are a million things in your way, chances are you’re going to get distracted. When you’re about take that first bold step towards career enlightenment, it is essential to eliminate any obstacles. Set a day aside to write down any excuses you regularly use for procrastination and anything (including television, video games, etc.) that you know will take you off course, and jot down a solution to stop them slowing you down (for example, set aside a whole evening each week shut away in a room with nothing but a desk and a laptop). Not only will you feel like a load has been lifted, but you’ll also have the clear head you need to take action. Now you’ve carved out your path and found a way to keep your obstacles at bay; it’s time to find out everything you possibly can about your new industry. Go online and look at elements including median salaries, entry requirements, different branches, and job opportunities within the sector, plus influential figures. Not only are prominent industry figures a fantastic source of information, but they may also be the people that help you accelerate your career or give you that all-important first break. Once you’ve learned everything there is to know and exactly where you want to apply, it’s time for the next step. The world of work is competitive and to thrive, especially at the start, you will need to take measures to become that glistening needle in the giant haystack. To do so, you will need to update your CV and craft it to the standards of your new industry (and please make sure you proof it before signing off), speak to any relevant recruitment agencies, and use online resources to submit your skills publically. New Shifts is an excellent platform on which to create a profile outlining your experience and offer your spare time to exciting startups and SMEs. Now you’ve done your research, submitted your skills online, and prepared your application materials, the best thing to do is build your network. Leverage the current social platforms you use – including LinkedIn and New Shifts – by making your profiles look as slick as possible and connecting with the right people in your industry. Share your thoughts, insights, and any industry related news with your audience, and start meaningful dialogues with people by commenting on relevant articles. Not only will this help get you noticed, but it’s also great practice for networking in general. Now you’re ready to go out there and grab the job of your dreams, or make that vital step at least. Find the jobs you want to apply for, learn all you can about the hiring manager and staff in your potential new department, and put together the best darn application the world has ever seen. Take your time. Consider just offering your spare time before you take the plunge. This way you can really find out if your new career path is for you. Once you’ve finished everything, leave it for a day or two then check it over again with fresh eyes; getting a friend to cross- check it is also a good idea. While you’re applying, continue to upgrade your skills by taking relevant courses and subscribing to key industry publications – just make sure you update your CV as you go. Remember, your career move may not happen overnight, but by following the above steps and displaying a little patience, and adding a sprinkling of perseverance, great things will happen.